Can I Lose Weight Eating or Drinking Watermelon? Fruits and vegetables tend to be low in calories, making them good choices for people on a weight-loss diet. Watermelon is no exception -- it is low in calories and provides beneficial nutrients, including lycopene to limit your risk for cancer and the antioxidant vitamins A and C. This fruit isn't a weight-loss miracle food, however, so you still need to eat fewer calories than you burn to lose weight. A whole cup of diced watermelon is just 46 calories. This is because watermelon is 91 percent water, which doesn't have any calories. Almost all of the calories in each cup of watermelon come from the 11.5 grams of carbohydrates in one serving, but watermelon also contains 0.2 grams of fat and 0.9 grams of protein per cup. Foods that are low in energy density, or calories per gram, make it easier to lose weight because you can eat a larger portion of food without consuming too many calories. The Centers for Disease Control notes that it is the volume of food you eat that makes you feel full, not the amount of calories the food contains. Watermelon is very low in energy density, with just 0.3 calories per gram. If you want to lose weight, you can't just add watermelon to your regular diet. You need to replace less healthy foods that are more energy dense with watermelon. You need to create a calorie deficit of 3,500 calories to lose 1 pound, which you can reach by making simple changes to your diet -- such as eating watermelon instead of a sweet treat for dessert. For example, if you have a cup of watermelon for dessert instead of a slice of apple pie, you avoid 365 calories. 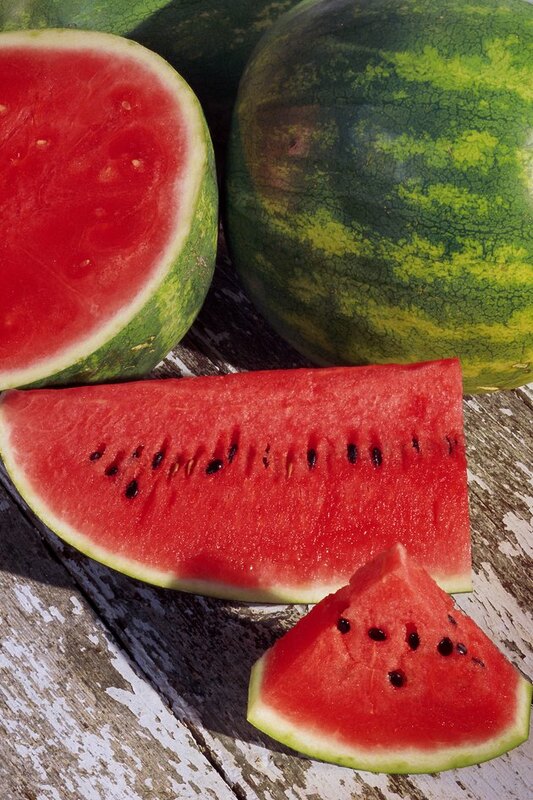 Choose a cup of watermelon instead of a slice of frosted chocolate cake for dessert and you'll avoid 491 calories. You may find it easier to lose weight if you eat watermelon instead of drinking it. Many recipes for watermelon juice contain added sugar. Smoothies that include watermelon are also likely to be more energy dense than plain watermelon because of other ingredients, such as honey, yogurt and fruit juice. If you use a juicer to extract the juice from the watermelon, you'll also remove the small amount of filling fiber it contains. Mix the watermelon in a blender with a small amount of water or ice to make a juice without losing this fiber. Just be careful not to add too much sugar or honey to your juice, or you'll greatly increase the calories. Can Watermelon Stop You From Losing Weight?